In the summer, Pikachu & Co. are on an island where there is a playground that they enjoy spending time in. However Meowth is also on the island and has a plot against the other Pokémon, however in doing so he draws out Wynaut and takes the Playground. 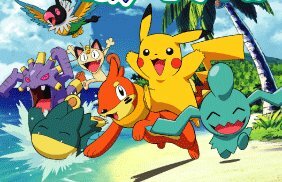 Pikachu and the other Pokémon including newcomers Buizel & Chatot have to take the playground back from Meowth.